Numbered markers in the text may be created using the footnote function of word processing software. 1. Geoffrey Blainey, Black Kettle and Full Moon: Daily Life in a Vanished Australia (Penguin/Viking: Melbourne, 2003), 7. Your bibliography should document all the works you consulted in preparing your essay, whether you cited them directly, or not. Entries should be listed alphabetically by the first author's surname or family name. If there is no named author, list by the first word in the work's title, ignoring 'A', 'An' or 'The'. The date an e-journal was accessed is not required in Chicago style but may be required in certain disciplines. If included the date should precede the DOI or URL, separated by commas in a note and periods in a bibliography entry. There are two styles of referencing outlined in the Chicago Manual of Style, 16th edition. Consecutively numbered markers in the text refer the reader to bibliographic citations in footnotes or endnotes. A bibliography at the end of the document provides full details of all sources cited and consulted by the writer. This style is not included in this guide. Footnotes are used to indicate a citation. A superscript number is placed within the text (where needed - not necessarily at the end of a sentence) to indicate a footnote. The number is repeated at the beginning of the footnote at the bottom of the page, and is full size, (not superscript) and followed by a full stop. When citing a source for the first time, always cite in full. Subsequent footnotes of the same source (consecutively listed) are replaced with the word ibid, followed by the page number. Subsequent footnotes of the same source (not consecutively listed) are shortened. If a source has three or more authors, always cite in full the first time, and subsequently shortened to First Author et al. The author's name is not inverted, and is written in full. Publishing details of books are enclosed in brackets. Journal titles, book chapter titles are enclosed in double quotation marks. The first line of each footnote is indented two spaces from the page margin. Alphabetically lists all sources cited and consulted for the assignment. Arrange the list by author's surname, or title if no author is give. 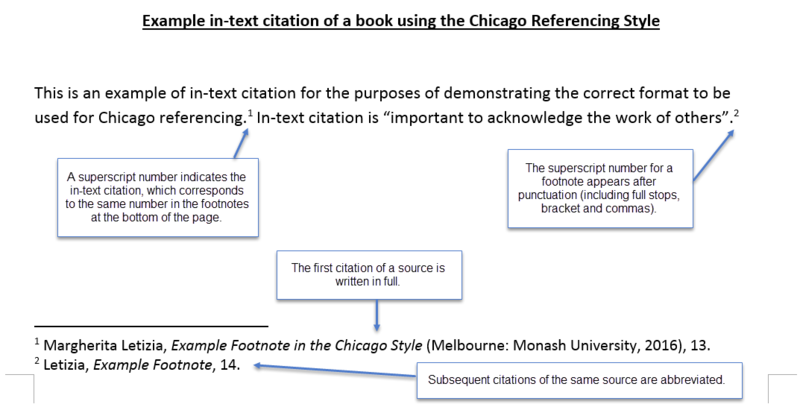 Different source types require slightly different information to be included in the citation (refer to the source types listed under the Chicago tab). The format of citations in the bibliography is similar to that used in the full footnote citation. However, the following differences are important. References must be listed alphabetically. Include indefinite articles (the, a, an) but ignore them when ordering your references. 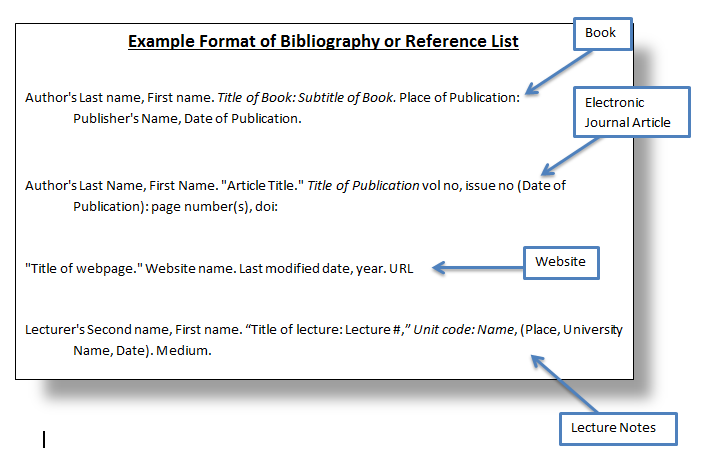 References in the reference/bibliography list should be indented on the second line (in cases where reference is two or more lines). The name of the first author is inverted, so that the surname or family name appears first. The elements, or sections, of the citation are separated by full stops, not commas. Publishing details for books are not enclosed in brackets. Subscript numbers are always placed after punctuation (eg. full stops, brackets and commas). Footnotes and references should always end with a full stop (except in the case of where a URL or DOI are inserted). The title of a resource should be capitalised (e.g. An Encyclopedia of World History).